NASA is planning to build hypersonic jets that will fly through the Earth’s atmosphere and slash flight times around the world to a few hours at most. The US space agency wants to manufacture a craft that would travel at five times the speed of sound and bring in a new age of aircraft akin to a turbo-charged Concorde. Travelling at such speed would reduce the flight time from New York to Sydney to around two-and-a-half hours, from the 21 hours it is now. The project is thought to be aimed at making a reusable aircraft that could fly to Mars but, as with previous space technology, it could have a huge impact upon passenger transport too. Under the NASA Aeronautics 2010 proposal, the space agency will allocate $5million per year for the next three years to make the new aircraft a reality. The aim is to create something which can carry passengers through the atmosphere, descend and land safely before being reused. NASA is also aware of the many challenges it faces to build such a machine. 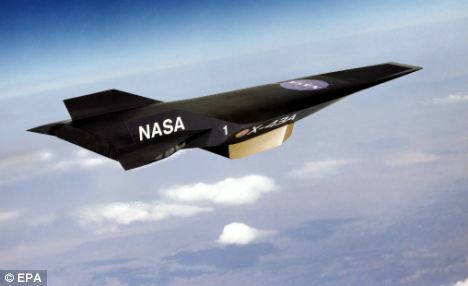 The proposal says: ‘The hypersonic heating environment, coupled with the emphasis on reusability, creates additional severe technology challenges for materials, material coatings, and structures that not only carry the aerodynamic loads of the air but also repeatedly sustain high thermal loads requiring long-life and durability while minimizing weight. Hypersonic aircraft is still a fairly new concept and follows on from Concorde, which flew at Mach 2, or twice the speed of sound. A hypersonic aircraft would reach Mach 5, or five times the speed of sound. In June this year an experimental scramjet aircraft set a record for hypersonic flight, blazing through the air for more than three minutes at Mach 6, or more than 4,500 mph. The X-51A Waverider scramjet was released from a B-52 bomber last week before its engine took it to Mach 6 and it flew autonomously for 200 seconds. Scramjets work by using oxygen rushing in through the engine at supersonic speeds to ignite hydrogen fuel. In October Richard Branson’s Virgin Galactic SpaceShipTwo completed its solo maiden flight after being carried aloft by its mothership to an altitude of 45,000ft and released over the Mojave Desert. Built by famed aircraft designer Burt Rutan, the craft aims to be the first opportunity for space tourism at something close to an affordable price – tickets cost $200,000 (£125,000). The craft is based on a prototype that won a $10million (£6.3million) prize in 2004 for being the first manned private rocket to reach space. The six-passenger ship will undergo rigorous testing before it can carry tourists to space. Previous How TERRORISTS can get in!